Starring as a young teacher plagued with visions, Tatyana Ali ( Zoe Ever After, Love That Girl!, The Fresh Prince of Bel-Air) returns to TV One in the new made-for-television movie Second Sight . Starring as a young teacher plagued with visions, Tatyana Ali ( Zoe Ever After, Love That Girl!, The Fresh Prince of Bel-Air) returns to TV One in the new made-for-television movie Second Sight . Premiering Saturday, April 23 at 8 p.m. ET, Ali plays Clara Randall, whose gift of "prophesy" leaves her haunted by premonitions of horrific kidnappings. Despite people's unwillingness to believe her "second sight," Clara takes it upon herself to search for one of her students who has gone missing. Shot on location in Los Angeles, this suspenseful thriller marks the third project executive produced by Radio One Founder Cathy Hughes and Executive Vice President of Special Projects Susan Banks. "First with horror, and now suspense, Ms. Hughes and Susan Banks have once again ushered TV One into an entirely new genre for the network," stated D'Angela Proctor, TV One's Head of Original Programming and Production. "Driving the network into fresh and unexplored territory is exactly what our new brand promise represents - taking chances and defying expectations." Living in a constant nightmare, Clara ( Ali) has trouble understanding her abilities as well as convincing others - specifically her boyfriend Tony Prescott ( Texas Battle, The Bold and The Beautiful) - that the visions are not just a figment of her imagination. After "seeing" the abduction of a student from her school, she realizes she must take matters into her own hands by following the clues from her visions. Along her mission to save this innocent life, Clara discovers disturbing secrets and lies surrounding those she trusted most. Denise Boutte ( Meet The Browns, For The Love Of Ruth) also makes her network return in the role of Tamara Johnson, Clara's best friend. Rounding out the cast of stellar actors is Edwina Findley ( Get Hard) as Donna Gray and Sharif Atkins ( White Collar, Rizzoli & Isles) as Richard Gray, the parents of the kidnapped student Mary Ann, played by Jessica Pressley ( For The Love of Ruth). 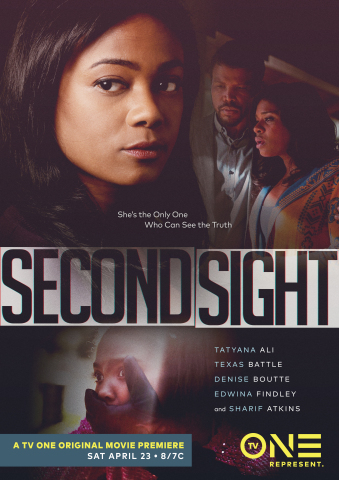 Second Sight is produced by Digilab Productions for TV One. Radio One Founder Cathy Hughes and Executive Vice President of Special Projects Susan Banks serve as executive producers. Second Sight was written by Susan Banks and Michael Scott serves as Director and Producer. For TV One, Jubba Seyyid is executive-in-charge of production, Robyn Greene Arrington is vice president of original programming and production, and D'Angela Proctor is head of original programming and production. Encores of Second Sight will also air on TV One on Saturday, April 23 at 10 p.m. ET and Sunday, April 24 at 8:30 p.m. ET. For more information about TV One's upcoming programming, including original movies, visit the network's companion website at www.tvone.tv . TV One viewers can also join the conversation by connecting via social media on Twitter, Instagram and Facebook ( @tvonetv) using the hash tag #SecondSight and catch clips and promos on TV One's YouTube Channel.